‘I DON’T LIKE TO THINK OF MYSELF AS A REFUGEE. I used to live in a lovely part of Aleppo, and I spent my twenties studying human research, travelling the country and working as a civil engineer for the government. I met my husband six years ago, when I was 34. He was a doctor, but I remember being introduced to him and not being that fussed. He, on the other hand, pretty much immediately asked to marry me. Eventually I gave in – I think I knew inside he was The One. From then on, we were inseparable. Our house was old and beautiful, with huge, high ceilings, white walls and tiled floors. We spent our days at work and our evenings with friends – eating out, listening to music… being normal. At the start, I wasn’t scared when things started to change. I didn’t think it would affect me. But after months of rebel soldiers fighting against President Bashar al-Assad, bombs started falling. All the different groups started attacking each other, and then ISIS started trying to take over the country, too. I’m a Palestinian, but the war on Gaza was nothing compared to this. There was no running water, no electricity. Rules started being enforced in certain areas, forbidding us from keeping photos on our phones, from using American products, from going outside after dark. If you disobeyed, you disappeared. We stopped leaving the house at night and stopped seeing friends. I used to lie awake hearing the bombs fall, wondering if we’d make it through the night alive. I carried on going to work, but there was nothing to do. Aside from the war, everything had come to a standstill. If you walked down the street, you didn’t see anybody. Everybody was out of sight, hidden in the back rooms of their roofless houses, behind walls that had been blown apart. When I gave birth to my first daughter, Sham, my family couldn’t cross the country to meet her for over a year. I was just a few months pregnant with my second child, Bisan, when they started bombing the street we lived on. With Sham in my arms, I grabbed a bag with my passport, and ran. We rented another house in another, supposedly safer, part of the city. Then the food started running out, and we found ourselves eating dry rice for every meal. But that was the least of my worries. It was only in April this year, when I fell pregnant for the third time, that I accepted we had to go. I didn’t plan to have another child – at the start, I wished for it to die inside me. Better that than grow up in a country full of fear. Sham and Bisan were two and three, but they never played outside. 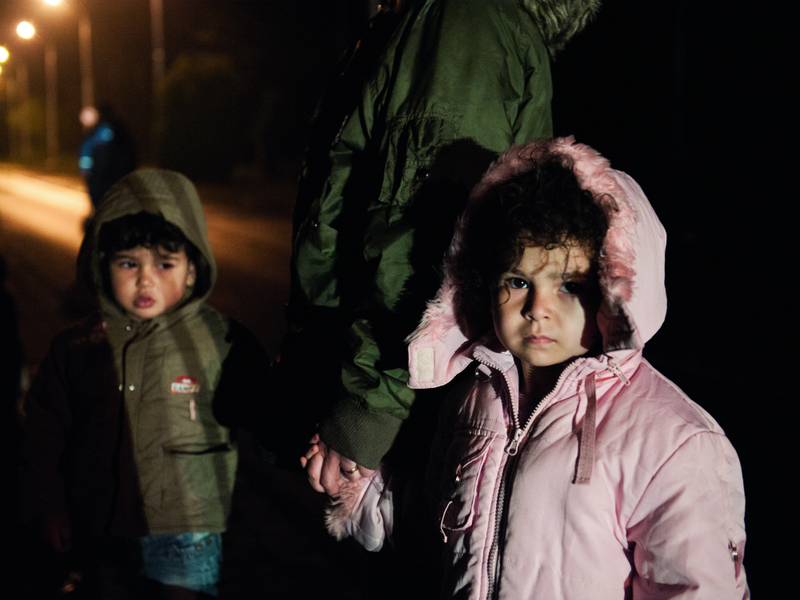 They couldn’t go to nursery – they might not go to school. Still, my husband didn’t want to come with us – as a doctor, he feels needed there. For five months, we argued every day. But in the end, he let us go. The last thing he told me was that I had to keep myself and our children safe, because we’re his whole life. If I didn’t, he said, then the pain wouldn’t be worth it. You’d think you need suitcases to move across the world, but when it comes down to it, you only need yourselves. If you have enough savings, people will take you anywhere – even across borders. I laminated our birth certificates and my degree, and packed a bag with medicine, plasters and a change of clothes for my daughters. I’m Muslim, but I don’t usually wear a headscarf, so I disguised myself in a niqab that covered my hair, my throat and my body to attract less attention, and I wrapped my passport in cling film and bound it to my stomach. And then, early one morning in September, I wept goodbye to my husband and walked out of the city. Together, we walked and walked. I carried Bisan, and Sham kept pace alongside me. If Sham got tired, I’d tell her the baby in my tummy was tired too, and that was why I couldn’t carry her. 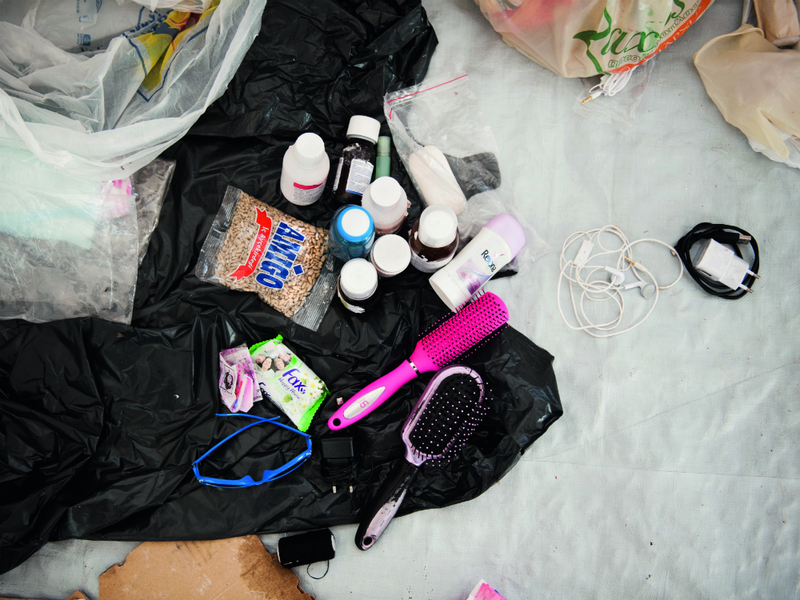 At night, smugglers showed us to a room with about 20 other people. Then we walked some more. When we neared Turkey, we paid a driver to take us over the border – we spent four hours hidden in the back of his car as we passed through the checkpoints, before taking a 14-hour bus to Izmir, a city by the coast. At 2am, we found a hotel, and spent three days hiding there. We didn’t leave for anything – not for food, not for fresh air. Nothing was worth the risk of being caught and sent back. Eventually, another smuggler came to say he would take the three of us to Europe for £1,500. He put us in the back of a van with about 30 others, and nobody knew where we were going. Then they yelled at us to get out, and they made us walk for hours through a forest. It was early morning when we stopped at a clearing. Everywhere you looked, there was rubbish: empty bottles, cans, wrappers, and old bits of food piled up, inches deep. We were made to sit on it and wait. There was no shade, and nowhere else to go. More and more people kept arriving, and the heat of the sun beat down on our faces. I only had one bottle of water, and I was so scared of it running out, I just used it to wet Sham and Bisan’s lips whenever they cried. It was evening by the time the men returned and took us to our boat. The dinghy bobbed up and down, threatening to topple over and toss us all in, and I felt nauseous as I carried Sham and Bisan aboard. More than 50 of us were crammed in, everything was wet, and I couldn’t move my arms or my legs. Even the lifejackets offered little reassurance. If you can’t swim, you don’t have a chance. 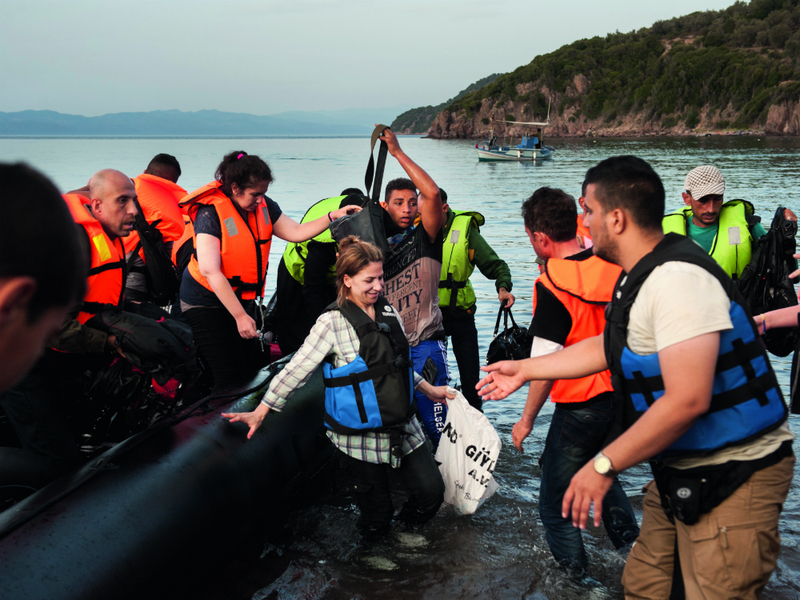 When we reached the northern shore of Lesvos in Greece, I couldn’t speak. I just pressed my daughters to me and sobbed. It was night by the time we reached Kara Tepe, the main camp in the south of the island. We weren’t allowed to take taxis or stay in hotels – even though they were empty, and I had money. Using light from a phone, we stumbled through the darkness towards the tents. Sharp rocks jutted through the tarpaulin groundsheet, and flattened-out cardboard boxes made up our beds. In Arabic, somebody had written a prayer to Allah in felt tip. Our clothes were still wet from the sea, but there was nothing to change into. Sham and Bisan slept, but I lay there for hours, shivering and scared. In the morning, the camp was busy. Two thousand people had arrived overnight, and the air was thick with ammonia and flies. I didn’t know where to go, who to talk to or how things worked, so I sat in the tent, waiting for our things to dry. Loudspeakers told us to form a queue to register, and riot police stamped on the ground. I borrowed clothes for Sham from a neighbouring family and took her to the toilet, but a man pushed past her and she fell into the dirty, stench-filled mud. Tears filled my eyes and she squeezed my hand. “Don’t cry,” she told me, and of course I cried more. After registering, I booked tickets to travel to Kavala. For nine hours, we sat on a ship, while Greek men stared at me and muttered under their breath. Bisan and Sham alternately squabbled and slept. The next 1,500 kilometres passed in a blur. Train after train after bus after bus. Thessaloniki to Idomeni to Gevgelija to Slanishte to Preševo to Belgrade to Kanjiža to Horgoš to Röszke to Hegyeshalom to Nickelsdorf. One foot in front of the other, one step at a time. Yazan, a 19-year-old from Damascus, saw me struggling, and put Sham on his shoulders while I carried Bisan. In Serbia, the Mafia was everywhere, trying to make money from our struggle. They put on fake buses and would charge twice as much. 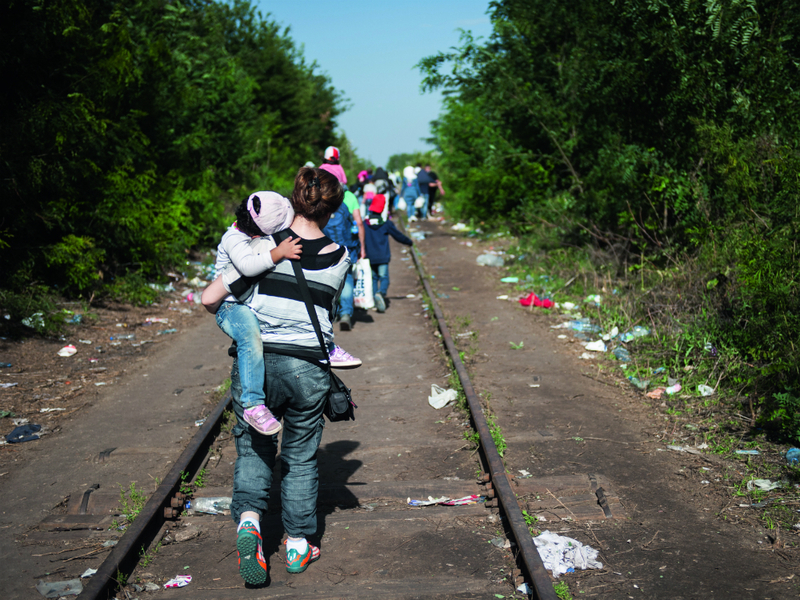 In Hungary, we were lucky – the border hadn’t closed, but we spent two hours locked on a stationary train. By the time we reached Vienna, I’d hardly slept for three days. My back ached, my bump hurt, and everything felt slick with sweat and dust. We queued for six hours to buy tickets to Munich. Bisan cried while Sham sat silently in a stranger’s arms. That night, I found an apartment. I WhatsApped my husband from my room. I had a small rollerball bottle of his aftershave, which I held to my nose to get to sleep. The next day, we took the train. I looked out the window at the green fields. But at Salzburg the train stopped, and policemen yelled at us to disembark. Unless you were from the EU, you couldn’t cross. An Arabic taxi driver took pity on us, and told us how to travel to Germany on foot. We took a bus to a village near the border, and then we just walked over the mountains. 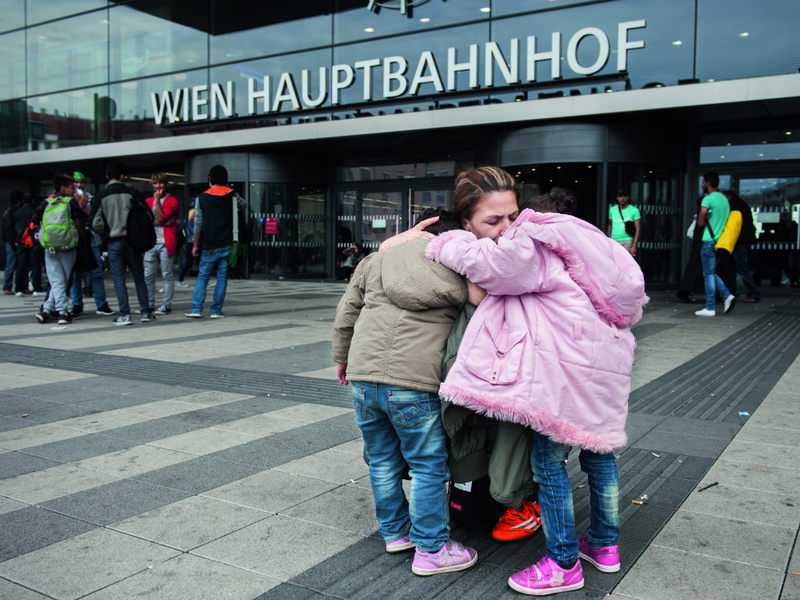 I’d never cared about making it to Germany before – I just wanted to get somewhere safe. But when I walked past the sign saying “Bundesrepublik Deutschland”, I almost let my guard down. Of course, that wasn’t it. The police took all of 55 minutes to turn up. They spotted us waiting by the side of the road, and could tell from our bags and our clothes and our skin that we’d crossed into the country illegally. We were put in the back of a riot van, and driven to a police station near Freilassing. For three hours, a translator questioned us, “How had we known how to get into Germany?”, “Had we paid anybody to take us?”, “Where did we want to go?” At 11pm they said we could go to the train station, if we paid £50 for a taxi. We were given different coloured wristbands – the kind you’d get if you were going to a festival or a party – and at midnight, our group was taken to Munich. An hour into the journey, Sham had a nightmare, and woke up screaming. I don’t know what I was expecting when I got to Munich – I was just heading to the safest place I could think of, where we could bide our time before returning to Syria when the war ends. Everyone I know wants to go back. I did think I’d be able to make friends in Germany, or start to learn the language. But on our first night, we had to sleep on a bench, and the next, we were taken to an old army barracks. Then my passport was confiscated, and so far, nobody has told me when I’ll get it back. It’s cold here, and we all have the flu, but there isn’t any medicine. I’m scared of being forgotten about, and sometimes I feel so lonely it’s hard not to cry all the time. 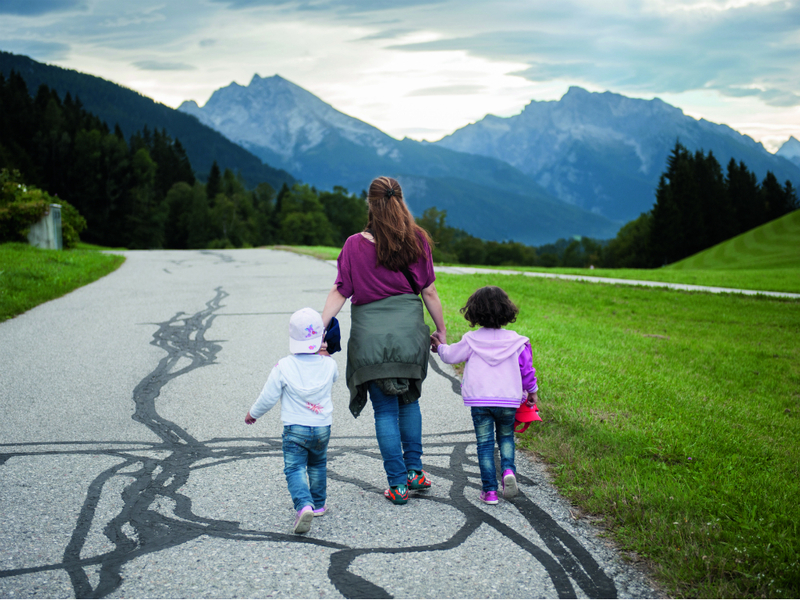 READ ABOUT MARIE CLAIRE’S JOURNEY FROM GREECE TO GERMANY HERE. If you’d like to donate to the International Rescue Committee, working in camps across Greece, Macedonia and Turkey, visit rescue.org. 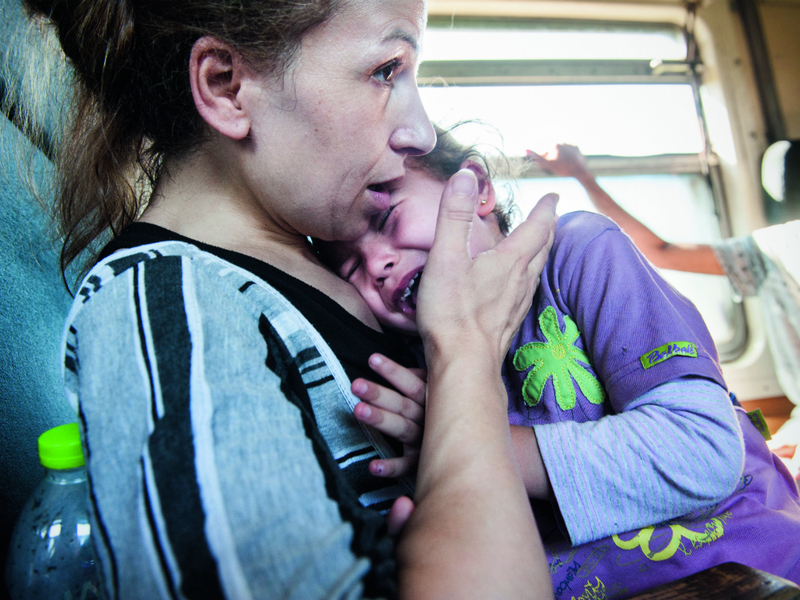 Medecins Sans Frontieres is providing medical aid and support to refugees across Europe. Visit msf.org.uk.